95% of the worlds 20,000 species of bee are solitary rather than social bees. 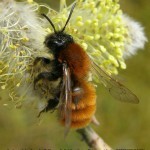 Ireland has 99 bee species, of which 77 are solitary bees. 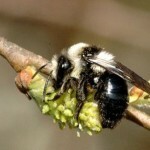 Solitary bees exist as a male and a female. 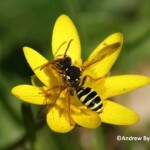 When a male and female solitary bee have mated and prepared a nest for their eggs, they die off leaving the eggs to overwinter, and the young to emerge and fend for themselves the following year. Climate change will bring new solitary species to our shores. 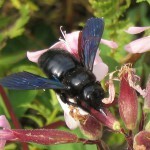 The violet carpenter bee (Xylocopa viloacea) arrived in Waterford in 2007, although it hasn’t been seen since. Most solitary species are small and relatively inconspicuous, but Xylocopa viloacea looks like a bluebottle on steroids!